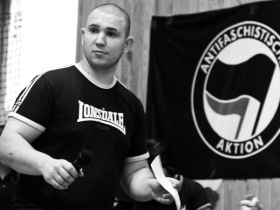 A leading anti-fascist activist has been shot and killed in Moscow, according to reports by Interfax on November 17. Ivan Khutorskoy, 26, was found by neighbors in the entryway to his building on Khabarovskaya ulitsa on the evening of November 16. Law enforcement agencies say they are investigating several possible motives for the killing, including connections to the victim’s anti-fascist activism. According to the monitoring group Institute of Collective Action, Khutorskoy had been assaulted three times prior to his murder. In 2005 his head was slashed with a razor, he received multiple wounds around the neck from a screwdriver and was beaten with a baseball bat during a second incident, and in 2009 he was stabbed with a knife in the stomach during a street fight. According to the website, Khutorskoy had recently been working as security for concerts put on by anti-fascist groups. Colleague Aleksei Grigoryev said in an interview on Svoboda radio that Khutorskoy had also frequently worked as security during the press conferences of the prominent human rights lawyer Stanislav Markelov, who was murdered last January. “In general, he was a visible figure for opponents; apparently this is why the fascists tried so persistently to liquidate him,” Grigoryev said. A rise in nationalist sentiments in Russia has contributed to growing clashes between anti-fascist activists, ultranationalist neo-Nazi groups, and authorities in recent years. A coalition of ultranationalist groups distributed instructions on how to acquire firearms at a large rally held during Russia’s November 4 Unity Day celebrations, while another group held a concert featuring neo-Nazi performers. The rise in fascist and ultranationalist extremism has additionally resulted in increased violence against dark-skinned migrant workers, as well as a number of recent murders. Stanislav Markelov, a high-profile lawyer known for his defense of anti-fascists and victims of human rights abuses, was shot dead in January in central Moscow. One suspect, a member of neo-Nazi organizations, was detained in early November and has admitted to the killing. In October 2008, anti-fascist leader Fyodor Filatov was killed after a fight between anti-fascists and ultranationalists in central Moscow in which four people were injured.